Along the rolling lands of eastern Nebraska, there is perhaps no more fascinating scene than the Logan Creek Valley in springtime. The sun and southern winds melt the snow along the bottom lands and the sky is filled with migratory birds that drop from flight to feed and take sanctuary in the tall native grasses. The view was no different in 1874. It must have pleased Ford Bella and Deborah (Watson) Barber as they arrived from Maine to homestead in Cuming County. Their cabin, the first built in Bancroft Township, later became the site of the Village of Bancroft. Six years later, the Barbers deeded 80 acres of their land to the Sioux City & Nebraska Railway in return for an agreement that, in addition to the railroad right-of-way, the company would plat a town. In 1880 a map of the town was recorded in West Point, the county seat. To the 25 people, predominately of German, Irish, and Scandinavian extraction, who lived there, it was known as "Barberville." However, Barber, being a modest man, did not want the town named for him. The Indians called it "Unaskta Zinga", meaning "little stopping place." The name "Bancroft" was finally selected in honor of George Bancroft, civil engineer for the railroad. In 1884 a portion of the Omaha Indian Reservation, some 50,000 acres, was sold to "actual residents," while the eastern portion was to be occupied by the Indians, "a peaceable and enterprising tribe." Bancroft is located on the southern edge of the reservation, 19 miles northeast of West Point, and was served by the Chicago, St.Paul, Minneapolis & Omaha Railroad. In 1897, 400 cars of grain, 500 cars of livestock, and 125 cars of hay were shipped out. It was customary for cattle feeders to "tip" the conductor $1, enabling them to ride in the caboose without a ticket. The world's longest-living poet laureate, John Gneisenau Neihardt, lived in Bancroft from 1900-1920, and studied Indian life. He was editor of the weekly newspaper, "The Blade," and wrote many of his famous literary works. The Neihardt Center, dedicated in 1976, hosts many interesting exhibits throughout the year. A special program is held annually on Neihardt Day, the first Sunday in August. 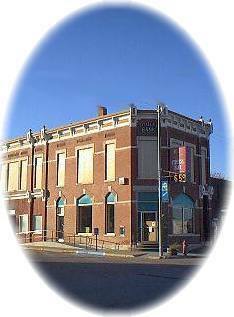 Bancroft celebrated its centennial in 1984 at which time there were three active churches, and in addition to the normal county and city services, a library, two elevators, two banks, a mini-mart, and a host of retail businesses.